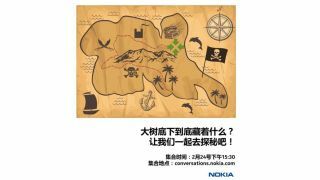 While most phone companies tend to keep their invites and teasers fairly straightforward, Nokia has decided to make us work by posting a treasure map and two similarly cryptic accompanying images to its Chinese Weibo page. First up there's an image of two monkeys, one in a tree, one on the ground. The fact that there's two of them could mean Nokia plans to reveal two phones, but that's pure guess work. The one in the tree also seems as though it could be a person in a monkey costume. Perhaps that's an obscure reference to Android? With a person that resembles a monkey rather than a robot that resembles a person. It's definitely a stretch but the next image also points towards Android. The second image is of the same tree, without the monkeys, but with its DNA-like roots visible. We're not sure what relevance the DNA has, but a section of root is clearly highlighted in green, making an X shape, which could surely mean nothing other than the long rumoured Nokia X is on its way. Finally the third image features the aforementioned treasure map, which again features an X. While there's no tree on the last image, it does have a tag in Chinese which translates roughly to 'What is hidden under the tree? Lets find out together on February 24!'. Update: Nokia has released another weird tree-based picture, this time showing a puppy near a tree being beamed up by a green UFO with an X on it. Forget the phones, we're just looking forward to Nokia explaining what all this means. But clearly the X is the focus, which means Nokia's 'X' branded Android phone is almost here as we expected. But is there anything else to be deciphered in these cryptic pictures? All will presumably be revealed on February 24 at MWC 2014. The Nokia X / Normandy might not be the only Android phone we see from Nokia this year.